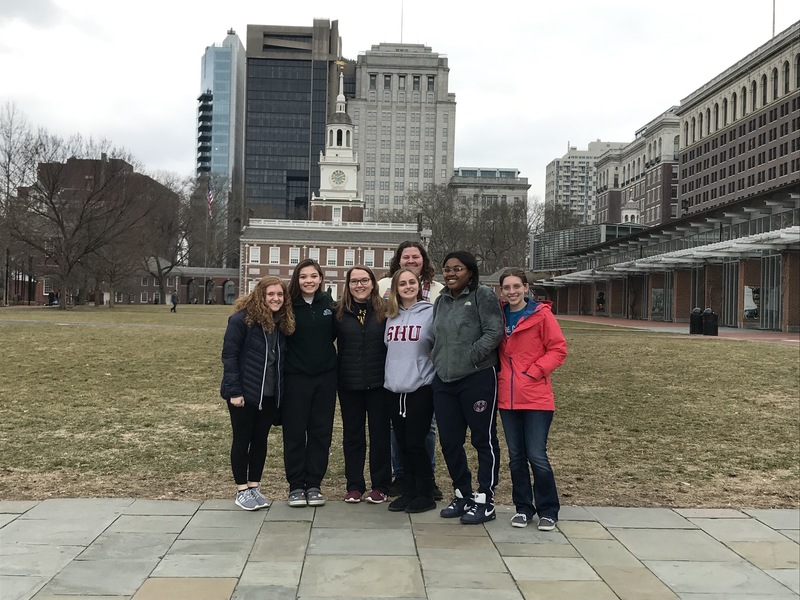 Seven Seton Hill students pose for a photo during their service trip in Philadelphia in March, which occurred over spring break. The students worked with the St. Vincent de Paul Young Adult Center and a variety of community organizations. Photo courtesy of M.Haynes. “Doing service projects gets you into a different environment, helps you meet people with similar interests and allows you to help people who might not have the same opportunities as you,” said Anna McClain, who was one of seven students who went to Philadelphia over spring break as part of Seton Hill University’s Alternative Break Program. The students worked with the St. Vincent de Paul Young Adult Center and a variety of community organizations, including PAR, Face to Face, Mercy After School Program, SPARK, Habitat for Humanity, Breaking Bread and a few others to help meet needs in the community. 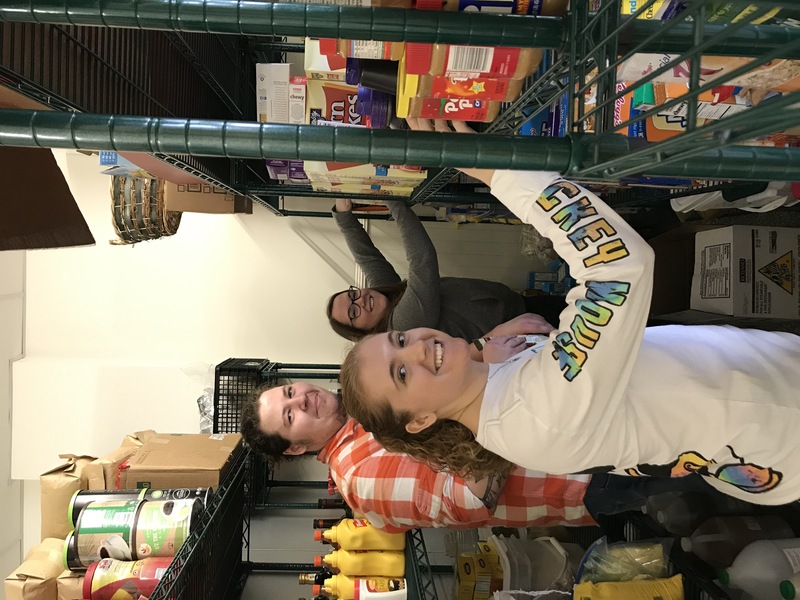 Seton Hill students smile for a photo as they organize the food pantry while working at Face to Face ministries in Philadelphia, where the students spent their spring break on a service trip. Photo courtesy of M.Haynes. “The main objective of the trip was to deal with homelessness and hunger insecurities,” McClain said. The student volunteers broke up into two groups: one sorted old electronics and cleaned an area to get formerly incarcerated men into a working environment, and the other worked with Face to Face in their soup kitchen and emergency housing. The students also worked with kids in the children’s center and on other projects. “It is critically important to me that students go out of their comfort zone and learn about the community they are surrounded by to work with others to transform the world,” said Marissa Haynes, the coordinator of service outreach who plans and orchestrates these trips. The student volunteers came from all different majors including business, art therapy and biology. “I would never have met the people that I spent spring break with if I hadn’t gone on this trip,” said McClain, who hopes to do the Alternative Break Program again in the future. 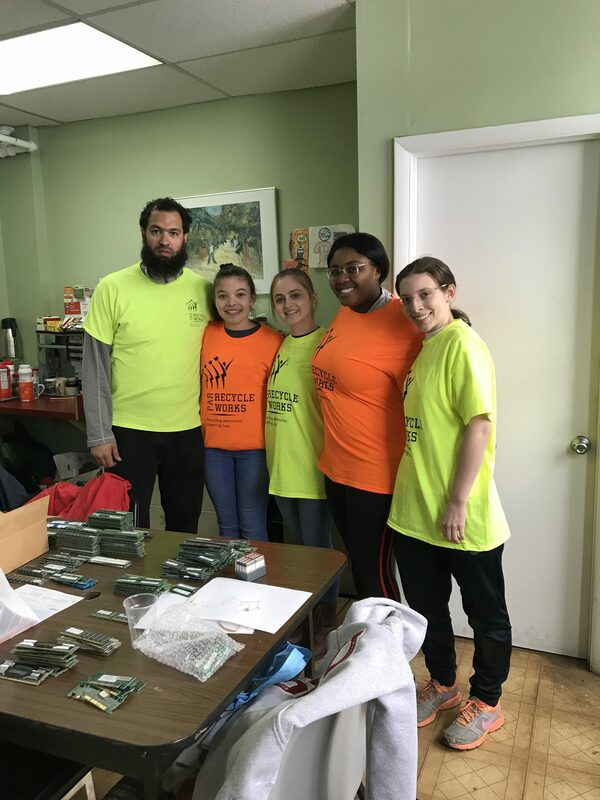 Pictured above are Seton Hill students with their supervisor for the day at PAR in Philadelphia as they sorted old electronics, where they volunteered during their spring break. Photo courtesy of M.Haynes. This year SHU offered three different service trips through this program: Habitat for Humanity (J-Term), Philadelphia (spring break) and New Orleans House of Charity (summer). Interested students filled out an application and then were assigned to a service trip based off of interest and personal strengths. “The Alternative Break Program allows students to engage in direct service experiences that promote personal growth, issue awareness and active citizenship in the global community while embracing the mission of Seton Hill and the Catholic Social Teachings,” Haynes said. The cost of the trips vary based on location and need, but fundraising helps to lower the expense. This trip was initially $500 a person. The Alternative Break Program works with Habitat for Humanity and the Vincentian Family to determine the location of their service projects. The locations change every year, and the Alternative Break Program is always looking for more student volunteers. “Get out of your comfort zone and try something new. If you’re interested feel free to reach out to me. We will be announcing our trips for next year soon,” Haynes said.